The newest edition of the award-winning CVHS publication is available now! Medical researchers debate the precise mechanism, but the association between cold weather and intensified joint pain is well known to people with degenerative joint disease, or osteoarthritis (OA). And those suffering are many. According to a long-running study conducted by researchers at the University of North Carolina, nearly 50 percent of people aged 45 years or older experience OA-related knee pain, and for people living to the age of 85, one out of four will develop symptomatic OA in one or both hip joints. 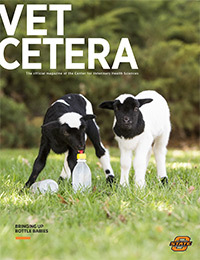 Oklahoma State University’s Center for Veterinary Health Sciences recently recognized faculty members for their excellence in research and teaching. The Oklahoma State Ranch Tour, slated June 5-6, will showcase some of the most progressive ranches in Northwest Oklahoma.